I had modded my deep blue delay clone for a volume control because I heard about volume drop issues, though I have none of them, but I really like the clean boost it gives me. Unfortunately I barely use the boost because I don't want the volume jump when turning on the DBD. 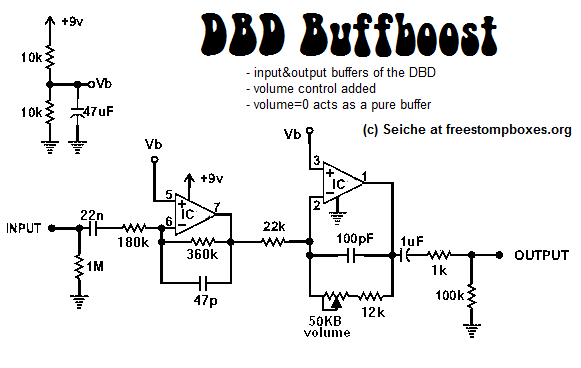 So I thought I'd try the buffers w/ volume mod as a standalone boost, giving me more flexibility for lead boosting, etc. I just built this one. I changed the circuit slightly to swap the 2 components of the op-amp and added a 100uF cap on the 9v line for extra smoothing (overkill i know but hey!!). I did a layout of my own (my first from a schematic) and it worked first time "WELL CHUFFED". Thanks for posting this one, it sounds really nice. This is my layout (not as compact as yours, i'm still new to this). That layout looks great! Good on you for doing your own! I found that doing my own layouts, while being a little work, is tons of fun, it's a little like doing word puzzles or sudoku but you actually have something to be proud of afterwards. Huge honour that someone got inspired by my post. I plan on posting more in a short while, as I will get some free time to build soon. I'll look forward to your next posts, i'm hooked on building my own pedals now. I don't know how i managed this i'm rubbish at word puzzles and sudoku, it did take me a while but i was very excited when when i connected it up and it worked first time !!! I built this last night. I have previously built a Mosfet booster by Jack Orman. I'll be playing a gig in a couple of days using both boosters with different instruments to get a comparison. I have sometimes gotten popping issues with the Mosfet booster. At certain locations it would pop loudly every time the boost was engaged even with RC circuits on the LEDs and pull down resistors on input and output. At other locations, switching was completely silent. I usually plug them into DI boxes which tend to vary and ground boost switches didn't have any effect. I'll be powering both with 9v batteries. I'm switching both with 3PDT stomp switches wired for true bypass. I'm curious to see if the op amp version alleviates the popping problem. 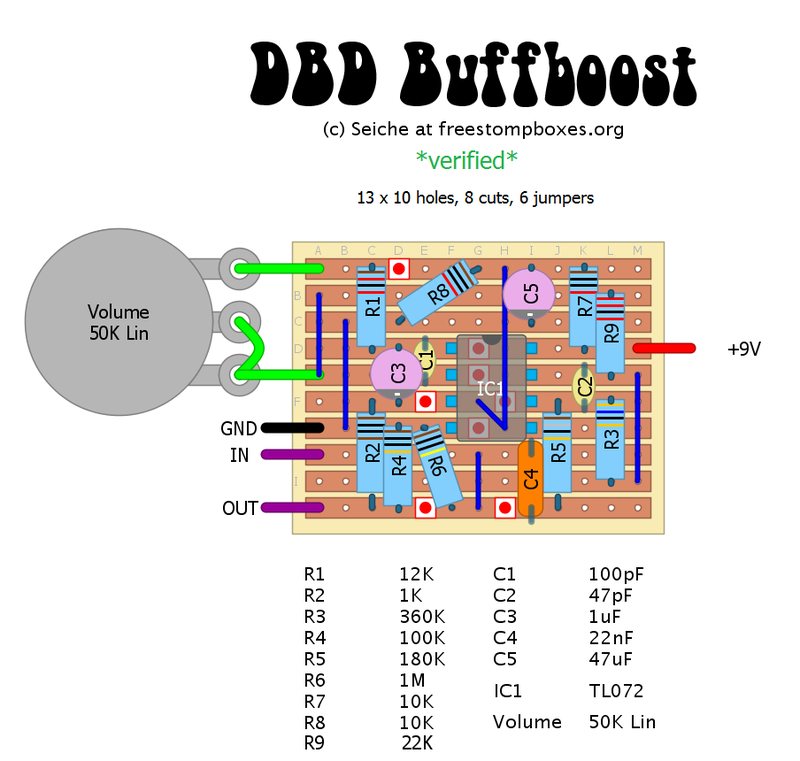 One big difference is that the Mosfet booster has a 5k volume pot and your circuit calls for a 50k pot. When turned down to 0, I get a nice unity gain buffer but unfortunately, most of the gain happens between 0 and 3, so adjusting the volume can be quite tricky. 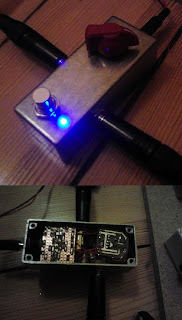 With the Mosfet booster, I start to hear decent gain at around 5 and the sweet spot for solos is between 6 and 7. 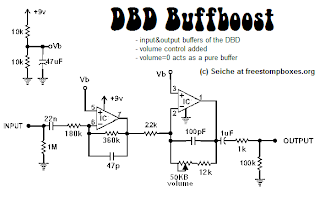 With the DBD Buffboost, the gain goes up sharply between 0 and 4 then seems to remain at about that volume up to 10. The Mosfet booster starts to distort at around 8 and at 10 it sounds pretty much like a big muff ;-) I almost forgot to mention that I'm using a TL062 instead of a TL072 just because I didn't have a TL072 on hand. Since they have the same pin-out, I'll try swapping op amps when I get a TL072 to see if there's a difference. I'm a little reluctant to start experimenting with the pot because I like the unity buffer. Is there a different pot value that would give me a more gradual gain without ruining the unity at zero? sorry for the late reply, I'm not checking this blog regularly. How was your gig and are you still using the pedal? Your issue sounds like you might have used a pot with the wrong taper. Make sure to use a 50k LINEAR pot. There are also LOG/Audio and Antilog/Revlog pots that will give a different taper of the range, leading to the problem you described (not a smooth transition in in Volume) in this design. The value of the pot (25k, 50k, 100k) will only influence the max volume, not the minimum and not the taper. The gig went well ;-) And yes, I'm still using the pedal. In fact, it's my favorite booster so far. I replaced the TL062 with a TL072 but I couldn't hear any difference in sound. The quick gain problem was still there. I swapped the 50k pot with a 25k, and now the sweet spot for solos is at 5 which gives me enough control, although I don't hear much volume difference between 5 and 10. The unity gain is unchanged at zero and the overall gain is minimal but enough for my purpose. I'm not using log pots, I only have linear ones. I guess the fact that I have to turn a 25k pot more to get the same impedance change, explains why the sweet spot is now at 5. Although I'm using identical anti-pop RC circuits for both pedals, only the DBD Buffboost is completely free of popping. I can't really figure out why the Jack Orman Mosfet booster still pops in some situations. The Buffboost alters my guitar sound slightly when boosted compared to bypassed. It has more high end, which I completely expected as it is a buffer. This effect is a net positive though, because I like the extra high end when playing solos as opposed to rhythm, so it's not a problem. Overall, I'm very happy with the pedal. Well done with the design! Thanks for the help.